Mars will most likely develop rings similar to Saturn’s, when its largest moon, Phobos, gets close enough to break apart, according to a recently published study in Nature Geoscience. 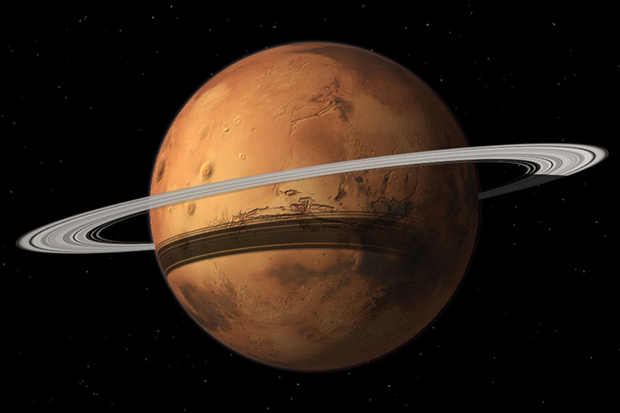 Mars would be the only inner planet with rings if this took place. Scientists predict it will happen in about 20 – 40 million years. Unlike Earth’s moon, which is slowly moving away from us, Mars’s largest and inner most moon, Phobos, has been slowly moving towards its parent planet, and once close enough, will be torn into bits by Mars’s gravity. The aftermath of Phobos being torn apart may result in a large ring orbiting Mars, as well as bombarding Mars with meteors for years afterwards. The study concludes that it is far more likely that Phobos will break apart before making contact with Mars, creating rings around the red planet. Phobos is the larger of Mars’s two moons, and is thought to be a “rubble planet” that is comprised of numerous rocks held together by gravity, to form a large clump with a crust only 100 meters thick, compared to Earth’s average 30 kilometer crust. Every 100 years Phobos orbits 2 metres closer to Mars, and is thought to break apart into thousands of small pieces over 20 million years from now, creating dense rings similar to Saturn’s. All planets in our solar system have had rings at one point in time, including Earth, though most rings were too unstable to last very long, and either rained down as meteors, or flew out of orbit. Only the outer gas giant planets: Jupiter, Saturn, Uranus, and Neptune have retained their rings, which will make Mars the only inner planet to have rings again, and will probably be the last time any terrestrial planet gains new rings. The researchers also said that several missions to Phobos have been proposed, and could help us learn more about asteroids, plate tectonics, and make measurements to test their theories.